National Art University in Denpasar offers education for young artists. Art Center nearby the university is the sanctuary of Bali fine arts which has the museum and the open stage and so on in the broad site. In every year, for one month from June, very famous Bali Art Festival is held and artists from Indonesia and overseas visit there. I got tired from walking. It is very large here. There is a small art museum inside. Denpasar has full of attractions. I think I prefer countryside to big city. Bali art is great. Various paintings are displayed in Art Center. 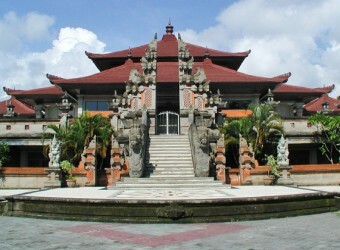 It`s very large, and it has a big stage, the stage is also used for Balinese dance practice. Barong dance costume can also be found here. It was very worth to go there.